Discussion in 'Knife Reviews & Testing' started by Thomas Linton, Mar 13, 2017. 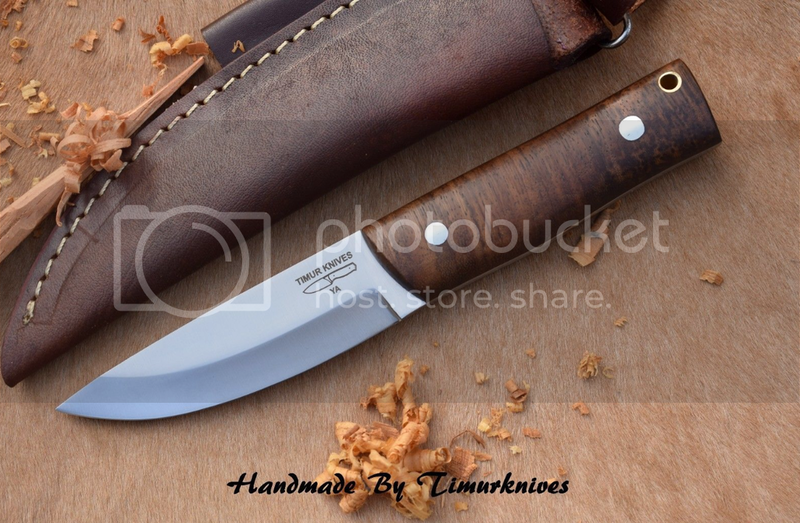 To investigate this eBay seller, I ordered a: "8 INCH CUSTOM MADE 1095 HC STEEL BUSHCRAFT KNIFE SCANDI GRIND WOOD TIMUR KNIVES"
Delivery was said to be estimated in eight days. It arrived in five days. The primary bevel is hollow ground about 40% up the width of the blade. There is a small secondary bevel. So, not "official" British definition of "Scandi." Sharp. Not sure of metallurgy without use. Grind symmetry is perfect to the eye except just OK at the plunge. Satin finish. Fit and finish of the handle is flawless. Nice wood. Rivets perfect. No liners. Sheath is dangler pouch and better then I expected for the price ($56.00) - fully functional, if thin leather, with an edge welt. Knife in sheath is 7.9 oz. The claim that the knife is "From Canada" is clearly a lie. As others have noted, the package is from Wazirabad, Pakistan, sent by DHL. Bottom line: Seems well worth the modest price, dependent on heat treatmment. Is it 1095? If you buy from such sellers you have to accept a degree of mystery. I won't buying another from Timur Knives "from Canada." When one does a Quartermaster or CFK, relying on integrity in other respects seems foolish. Bevel is not high enough, and it's hollow ground. Also has lanyard hole. Has a ricasso. So a Finn would not call it a "puukko" (except for marketing purposes) and it's their national knife. On the other paw, it's closer to a puukko than many knives given that label. I knew it was unlikely to be "from Canada," but it looked good enough to investigate. So a Finn would not call it a "puukko"
After two efforts to discuss this with "Timur," and getting brushed off, I left negative feedback: "Knife OK. Made in/shipped from Pakistan NOT Canada." Gave five stars for all but description. It was his 12th Negative and 8th Neutral in the past 12 months - all seem to be, at least primarily, over false Canadian origins claims. "Timur" then left retaliatory feedback: "This buyer has trouble with his AA AA AA. Beware"
eBay claims he a goner with eBay for misrepresenting the origin of his knives. "Not fair" to Pakistani sellers who don't lie. Too bad. As noted above, this is not junk. Better than some famous "made in USA/Germany.England" imports. Just could not leave off cheating. And if eBay won't fix it, Jared West has helped me find the cutlery guy at the feds. Good report, Thank you for taking one for the team and taking the time to post. He's back on the Bay, selling his knives as from "Wazirabad, punjab, Pakistan." Prices slightly lower. One final note: the knife I bought as "Scandi" was in fact hollow ground with a secondary bevel. I don;t think it is a deliberate disception so much as he uses "scandi" as a "good" adjective but does not know what it means. Sort of like CFK advertising their D2 as forged for hours until they learned that makes no sense. Also selling on eBay as "BlackbearKnife," not to be confused with Black Bear Knives of Boone, North Carolina - but he's trying. Still based in Brampton, Ontario, but shipping from Wazirabad. Also selling as "topqualityknives68" and "Aitch Knives"
Also selling as "KNIVESCOLLECTION" and "KNIVES-COLLECTION." Sometimes falsely claimed as being Canadian products - sometimes listed as from Pakistan. "8" CUSTOM MADE 1095 H.C STEEL BUSH CRAFT|SCANDI GRIND KNIFE|BLACKBEARKNIFE" "From Canada"
Also selling as "CBK but from Pakistan. Timur from Wazirabad, punjab, Pakistan, has new ePrey IDs- "Gary Brownell," " Gary Outdoor Knife," or "Gary Custom." "All our knives are 100% handmade. We do not use any CNC machining to make our knives. Each knife will be 100% unique and have may have some handmade characteristics that make them unique. YOU WILL NOT FIND A BETTER QUALITY HANDMADE KNIFE, ANYWHERE, FOR THE PRICE. THIS KNIFE HANDMADE BY MR.GARRY BROWNELL FROM NEWYORK. Sir Garry use usa made material in his knives." "IN THE MEMORY OF GREAT EMPEROR TIMUR ,TAMERLANE[.] HE WAS A GREAT ARMY LEADER,GREAT PERSONALITY ,HE WAS USE BEST KNIFE IN THE BATTLEFIELD , SO I AM ONE OF THE FOLLOWER OF TIMUR, MAKE QUALITY, DELIVER QUALITY... "